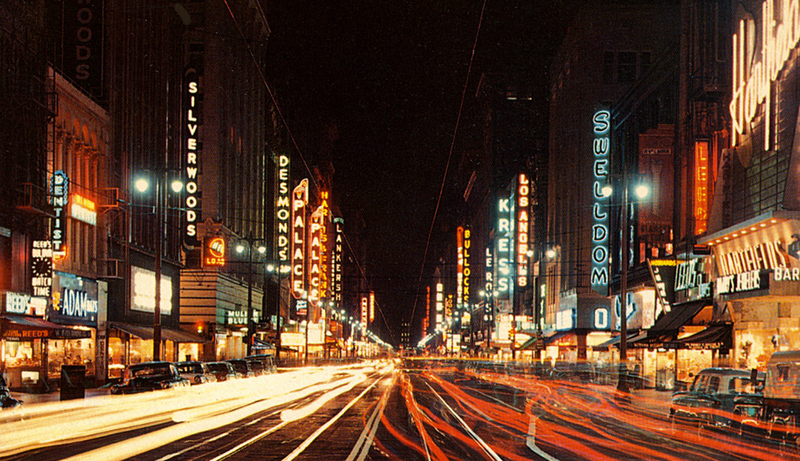 The bright lights of Broadway, downtown Los Angeles, 1959. Century 10 Downtown Theatre, Ventura. Brent-Air pool Supplies, Los Angeles. But in America, as across the globe, neon proved good for business and for the common man, with some 5,000 American glass blowers crafting the tubes by the 1930s and many other workers building the elaborately shaped light boxes to hold them. Ribbat quotes a manual from the 1930s aimed at neon makers: "It is very probable…that each small town will have its local neon shop." It helped that neon signs were relatively easy to create. "You don't have to be a rocket engineer to work with it," says Koga. "It's a basic technology that hasn't changed since the 19-teens." "Neon is not dangerous. It's an inert gas," she says. "We breathe it in the atmosphere." Lynxwiler says, "It's just gas and glass and electricity." "Neon has had a rough ride. It's definitely had a roller coaster of a life," Lynxwiler says. 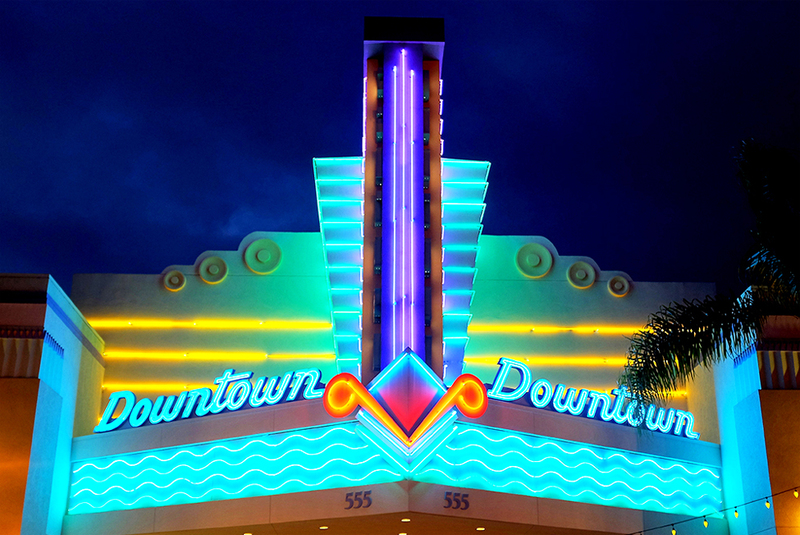 Neon boomed through the 1920s and '30s. In bigger cities, neon was used as the leading component in 'spectaculars'—immense advertising, theater, or casino signs that combined incandescent bulbs and neon tubes and movement. These signs defined the look of Times Square, Trafalgar Square, and the Vegas Strip. The first down slope was not the Depression but World War II. Attention turned to war production—there were no neon signs on carriers or battleships. And across the country any city seen as a potential target—Los Angeles and San Francisco included—had to turn down the signs. On the East Coast, Ribbat writes, "The amusement park at Coney Island ceased its restless flickering." After the war neon lights continued to be created. Signs were produced whose designs could today be called "mid-century modern," Linxwiler says, "based on the typography, the font design. Big, bold, sweeping fonts. One of my favorites is a Sears sign, saved by Los Angeles author and raconteur Charles Phoenix from the dump. It's one of the greatest pieces of mid-century design, with a big, sweeping, cursive 'S.'" By this time, though, neon began to take on a darker tone, one that had nothing to do with visible light. "In Las Vegas and New York, neon still was big in the 1950s and 1960s, but in other parts of the country the connotation of 'neon' was becoming more negative," Lynxwiler says. "When they lost the charm of the new," Ribbat writes of neon signs, "they became a symbol of urban decay, their light shining above all on those looked down upon as losers." Signs decorated pawnshops and tawdry taverns in inner city neighborhoods, the sorts of neighborhoods urban planners liked to move through with bulldozers. "A generation later what was new and gorgeous in the 1920s and '30s was seen as antiquated type of advertising," Lynxwiler says. "By the 1950s and 1960s it was no longer hip and new." Rather than use neon for signs, shops turned instead to a relatively new material, plastic, which was backlit with fluorescent tubes, whose light is colder and harsher than neon. The look wasn't brilliant, but it cost less than neon. 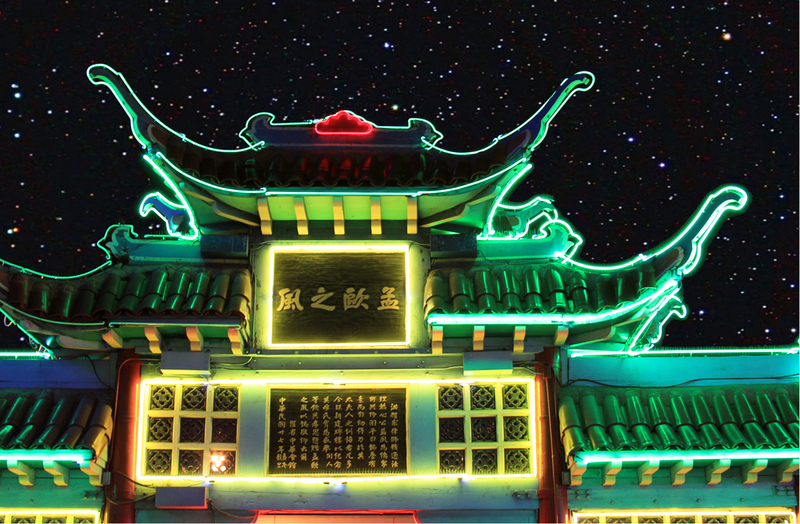 By as early as 1949, some cities began banning neon signs. Bel Air banned them that year.